Having missing teeth hinders your liberty to eat properly or smile in front of other people. Thus, this leaves you with no other choice but to explore tooth restoration options like wearing dentures. 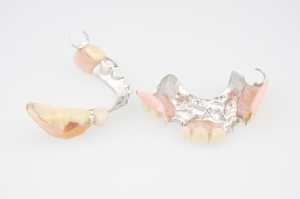 Known as a removable substitute for missing teeth, dentures are usually made of acrylic plastic and occasionally, metal and porcelain materials. This device fills the responsibility of your missing teeth, helping you to chew and speak normally. But what if your dentures get broken? What should you do? Well, if this unfortunate circumstance does happen to you, then you must consult your reliable Fortitude Valley dentist here at Precision Dental. Dentures are not only created for elderly patients. People at any age could possibly lose some or all of their teeth depending on their condition and might need a certain kind of denture. Tooth loss may deliver an emotional impact to some individuals knowing that teeth are permanent portion of the body. This is why to address tooth loss immediately, you should visit your trusted dentist. Since dentures are removable, the device is quite prone to damage especially if it’s not taken care of properly. The damage may result in cracks, chips, and fissures. But denture damage is very usual even for those who carefully use the device. This is why consulting your dentist for a denture repair is highly important. You can’t just fix your broken dentures by yourself; you need someone who’s a specialist in mending the broken portions. If your dentures are totally damaged brought by an extreme incident, then your dentist might recommend you in getting a new one. Maintaining the strength of your dentures is similar to how you maintain the health of your mouth and teeth. If you have broken dentures, seek professional help from your trusted Brisbane dentist. Here at Precision Dental, we don’t only do high-quality works on dentures; we also fix your broken dentures using our most advanced equipment and highest expertise. Call us today on (07) 3852 1160 or book an appointment online.